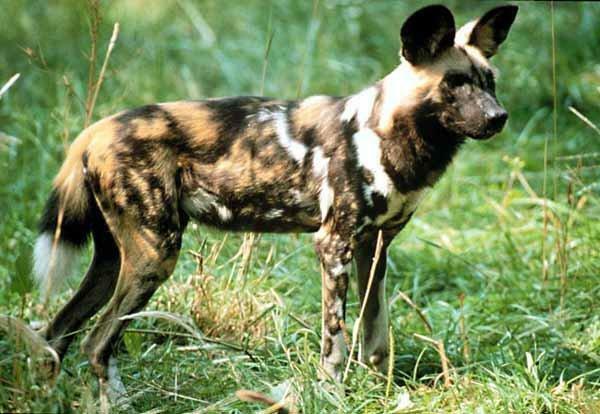 Animal Wildlife | African Wild Dog | The African wild dog (also known as the painted dog and the Cape hunting dog) is a large species of canine found across sub-Saharan Africa. 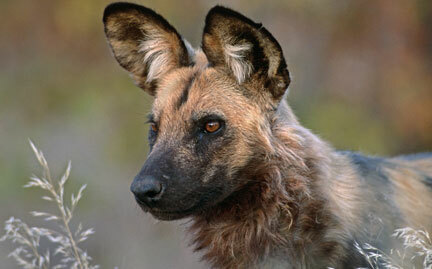 The African wild dog is most easily identified from other dogs by their brightly mottled fur. African wild dogs are found naturally roaming the deserts, open-plains and arid savannas of southern Africa were the range of the African wild dog has decreased rapidly. It is thought that the African wild dog was once found in nearly 40 different African countries but that number is much lower today, at between 10 and 25. The African wild dog is a large sized dog compared to other canine species, and it's mottled fur makes the African wild dog an easily identifiable species. 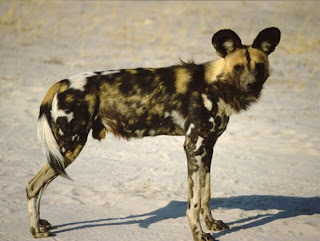 The fur of the African wild dog not only looks pretty but the pattern is unique to each individual, and helps the African wild dog to blend into it's surroundings. 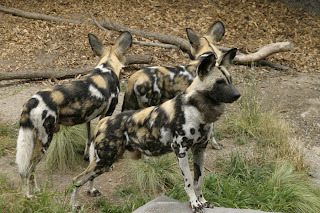 African wild dogs are sociable animals that gather in packs of generally between 10 and 30 African wild dog individuals. African wild dogs congregate together to hunt and it is thought that African wild dog packs were often much larger before the species became so endangered in the wild. The African wild dog is a carnivorous and opportunistic predator, hunting larger animals on the African plains in their groups. 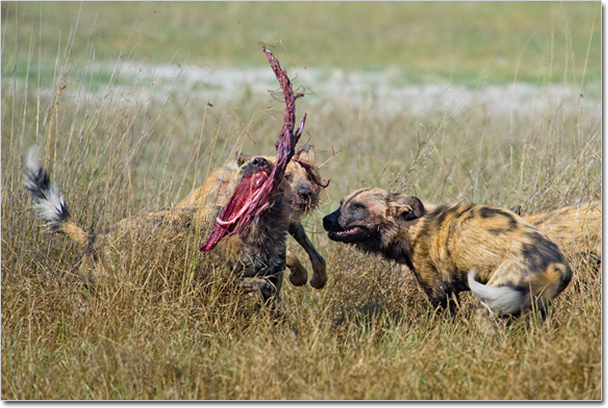 African wild dogs primarily prey on larger mammals such as warthogs and numerous antelope species and also supplement their diet with rodents and insects. 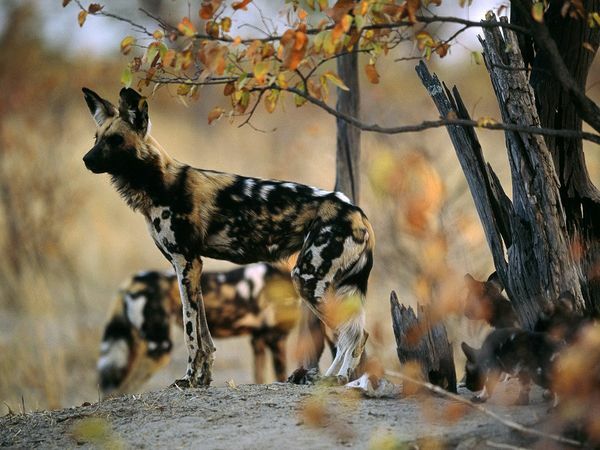 Due to the relatively large size and dominant nature of the African wild dog, the African wild dog has few natural predators within it's native habitat. Lions and hyenas have been known to prey on African wild dog individuals that have been separated from the pack, along with human hunters and poachers. 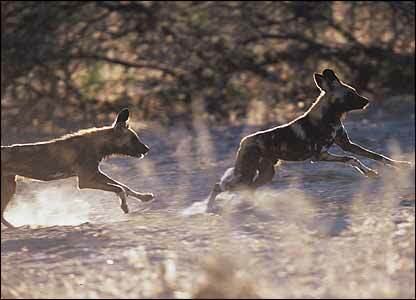 In African wild dog packs, there is usually only one breeding pair, which are the dominant male and female African wild dogs. After a gestation period of around 70 days, the female African wild dog gives birth to between 2 and 20 African wild dog cubs. 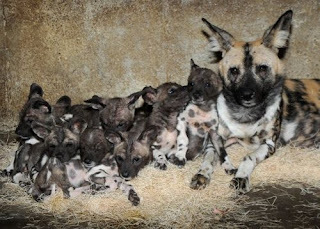 The African wild dog cubs are fed and cared for by the entire pack until they are old enough to become independent and leave to join another African wild dog pack. Today, the African wild dog is an endangered species as African wild dog population numbers have been rapidly declining. Habitat loss caused by deforestation and the spread of disease by livestock are two of the main causes for African wild dog loss. 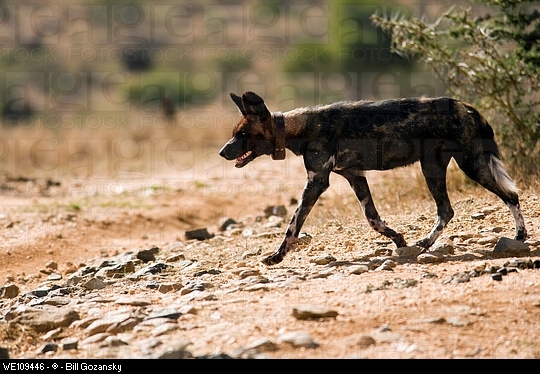 0 Response to "African Wild Dog"